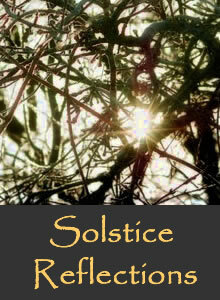 Solstice Reflections is an online gathering of reflections by seven women on the spirit of winter and the migration from darkness to light, collected by Stephanie in her blog Creative Living Experiment in the hope that these reflections may offer a momentary respite from a sometimes hectic season, allowing you to sit with your own reflections as you enter your personal winter. The Solstice Reflections include photography, art, poetry, a solstice podcast, and other contributions by Pixie Campbell, Liz Coleman, Juliette Crane, Jo-Anne Guimond, Rebecca Klier, Jen Lee and Kelly Letky. Stephanie writes: "I've always liked images of winter. They soothe me, calling me to slow down and take stock. It's why I've chosen to highlight the official arrival of winter in the past and why I choose to highlight it again here, now, with the help of other kindred spirits. During the next three weeks leading up to December 22nd I will offer guest posts from seven lovely women to help welcome winter, its rituals and its transformations - each woman interpreting the subject through the medium of her choice. I am warmed and humbled by the contributions I've seen, by the pieces of themselves these women have chosen to share with me and with you." it was so lovely to be part of the solstice reflection on stephanie's beautiful blog! happy holidays! if you look for something to read, browse the featured novels and novellas, the short story + poetry collections and anthologies. for a different approach, check out the various thematic links in the sidebar: about a place, the human condition, east/west, gender+race - or: first issues, prize winners, and e-books. 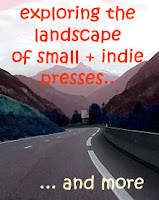 current issue of BluePrintReview: "in/stance(s)"
formerly named "Daily s-Press", now the "BluePrintReview book blog", this place explores + celebrates the landscape of small+indie presses, authors, books, and related projects. the blog is edited by Dorothee Lang, who also edits BluePrintReview.